Character TD Miquel Campos has released mGear 3.0: the latest update to his versatile open-source character rigging framework for Maya. The release introduces Flex, a new tool for updating the geometry of a previously rigged character, and updates Shifter, mGear’s modular auto-rigging system. Updated: Miquel has been in touch to say that mGear is now a team project. Flex was created by rigging artist Jérôme Drese. First released in 2015, mGear is based on Gear, Blur Studio technical animation supervisor Jeremie Passerin’s Softimage rigging framework, although it isn’t an exact copy. It provides character artists with a library of customisable rig components for different body parts, and is intended to generate “an infinite variety of rig combinations … without programming knowledge”. 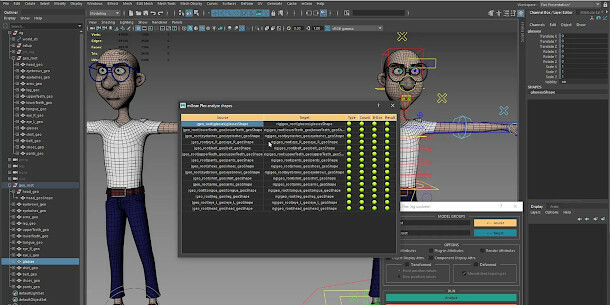 New features in mGear 3.0 include Flex, a new tool for updating the geometry of a rigged character without breaking the rig, shown in the video at the top of the story. Users specify matching geometry groups on the source and target models manually, then mGear identifies individual matching parts automatically, based on part name, poly count and bounding box geometry. As well as geometry changes, mGear can transfer UV updates between versions of a character. The plugin provides a fair degree of granular control: as well as native Maya attributes, users can choose to transfer those from plugins like Arnold, or custom attributes. The release also updates Shifter, mGear’s modular auto-rigging system. Games artists now have the option to separate the character rig from the character mesh, making it easier to export the character to a game engine in FBX format. There are also new options itended to make the elbows and knees of rigged characters more compatible with common game engines. In addition, mGear 3.0 introduces a range of new components for Shifter, including a chain FK spline with variable IK controls, a chain IK spline with variable FK controls, a whip chain and an FK spine. mGear is available now via an MIT licence. The framework works with Maya 2016.5 and above running on Windows, Mac OS X and Linux. At the time of posting, Maya 2019 is only supported on Windows. The source code has been refactored for mGear 3.0, which may break backwards compatibility with previous releases. You can find more information in the videos on the mGear YouTube channel.